Everyone has been affected in some way by the changes that the Digital Era has disrupted traditional Commerce - the physical local Stores from Shopping Centres to Main Street businesses that everyone typically relied on to supply their daily needs - that experience that has given everyone the physical outlet to see and feel products and services has been slowly disappearing, sometimes incrementally, sometimes dramatically. The annual hectic discount day like the Black Friday or the Day after Christmas is now a familiar scene where massive discounts are offered to clear stock or gain new customers - that type of selling unfortunately rolled over into the everyday trading that consumers expect more often. The change that Cloudfunding does is it builds upon that consumer excitement of 'buying power' and gives not only the individual stores the opportunity to get sales but it also gives the control to Shopping Mall and Precinct management in a digital way, which directly stimulates the surrounding local economy - giving the Group Management long-tail benefits that will never come from old world economics. In local and national economies the dynamics of Supply and Demand between a Buyer accepting the Seller's price is usually the single most important interaction between the two parties in local economies, and it's where it can become a choking point - it's this choking point where the Selling Prices don't meet the acceptable buying prices that the local Buyers can afford with their incomes - the initial response by Sellers is to discount, but then, when there's an extended period of discounting, the local economies fall into a recession due to the lack of profitability on the Supply side flowing value back into the local community - this traditional mechanism of what a Buyer pays and what the Seller receives is what Cloudfunding disrupts. What Cloudfunding does is it initially separates the Seller and their inventory from the local Buyer - that inventory is monetized entirely by a process termed as OutSell, it's where the Global Crowd operates in a unique democratic process to compete, just like wholesalers, to win each and every item in the Seller's inventory that has been listed to sell, without the Sellers needing to discount, pay fees or commissions. When Sellers list their inventory to Outsource the Selling they don't stand alone - the Global Crowd fully monetizes the Seller's listed inventory with Direct Foreign Digital Capital Investment - DFDCI, which democratically interconnects economies with a neutral international trading unit of account. By separating the Sellers and fully financing each item, means that the local Buyer is able to be given the chance to use Price Demand and buy at the price they want to pay as the Buying Prices cascade down, before other Buyers grab the deal - Price Demand brings a fresh approach to commerce with some degree of gamification to raise demand - at the same time it adds more buying power for the local Buyers, without interfering with the Seller's Selling Price - Price Demand creates a true free open market environment that achieves a unique real-time demand. The industry that is often under the microscope in losing the battle for a level playing field in our fast paced world is the Fashion Industry - where off-shore manufacturing and online stores has totally outmaneuvered the local manufacturers and local retailers, who now struggle to earn margins - Fashion Stores within the Shopping Malls and Precincts all display how hard it is to get sales, with discount signs constantly filling the front windows - OutSell and Price Demand change that pattern - what stands out with Cloudfunding with OutSell and Price Demand is that it can operate indefinitely without Sellers or Buyers being disadvantaged, unlike typical discounting. This same OutSell and Price Demand can be operated by Management of Shopping Malls to stimulate sales throughout the stores whenever there is a need to see more activity - Management can generate Generic Deals with various Selling Prices - like in the Hospitality Industry with Generic Deals for Rooms that can be drawn down by Hotels from around the world when they need to quickly fill room vacancies - these Deals are pre-processed and are fully monetized and ready to fit into the markets of the various industries to save time and give Sellers the means to grab the moment to get sales - Deals can be offered and taken up by stores within the Shopping Complex to draw in Shoppers already in the area, or even draw them in from the local regions. For situations where there are groups of Centres operated by a national or international company, it's vital in today's faster world to have better indicators to show the health of the stores under lease - traditional data can be weeks and months before there's any indication of how individual stores are trading - Cloudfunding provides a real-time indication of what's happening with store sales, giving a good indication of the individual Centre's revenue stream from leases, without being too close to the stores. Although individual stores can list their own inventory whenever they want, from the Centre's perspective it can be done on a major scale that takes in larger numbers of local Shoppers - it can draw Shoppers in, maybe only for one item, such as a Gift Card that can be purchased with Price Demand online in splash campaigns and spent with stores in the Complex, effectively providing a discount but not interfering with the full Selling Prices where the Cards could be used - stores could then take advantage of the Centre's inventory of Generic Deals that are processed at various Selling Prices that match the store's inventory - these types of Generic Deals can be implemented within seconds to grab the attention of the near-by Shoppers. Generic Deals can be an important part to clear perishables at the end of the day or even a season's inventory that normally is cleared by heavy discounting to make room for the new stock - Cloudfunding changes this scenario by getting the attention of nearby Shoppers with Price Demand and the cascading Buying Prices, while the Sellers still get the full Selling Prices. Shoppers have control of where they do their shopping and businesses know that having a close connection to Customers, the more chance that a business has of retaining loyalty or repeated sales - this however is increasingly more difficult to do without discounting. With Cloudfunding there's a different strategy of gaining Customer loyalty and incentivizing them with discounts whenever there's a need for sales - instead of tracking customers and their personal details, what Cloudfunding does is track the flow of the commercial productivity value between Buyers and Sellers on the platform without ever sharing any personal details - this global tracking is part of the New Economy and part of closing the loop in Commerce to bring value back to businesses and users connected to the Global Chamber of Economies. Groups and individual Sellers can collectively invite Customers into a program that allows the operator to notify the broader Customer base or selected demographics about products and services - the Queen Bee Program offers a single entity or there's the Seller Co-Operatives that offer a number of entities the way to operate together and benefit from the revenue streams that are distributed in the UDI Portfolios. 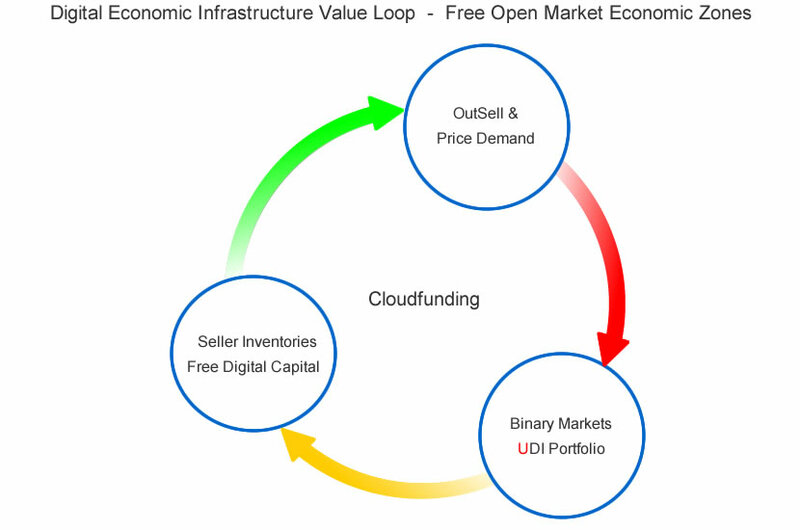 Precincts, cities and regions can take advantage of the Free Open Market Economic Zones that are automatically formed around the local Commerce and Trade happening in an area with Cloudfunding using OutSell and Price Demand to stimulate the local economy. With FOMEZs, the extra demand generated in the local productivity helps to increase the velocity of the trading value moving around within the zones - it's estimated that in many developed countries the volume of discounting ( based on an average 30% ) that frequently happens in the Retail sector alone - that value simply evaporates from the everyday trading activity and money flowing around in the local and national economies - that discounting volume alone would be enough to balance the deficits of many countries within 3 to 4 years from the additional tax revenue that could be re-claimed using Cloudfunding.